Barbara Zito: Barbara Zito is a creative writer and co-author of scientific manuscripts, including a published book chapter reviewing the scientific literature on sign-tracking. She has an extensive record of editorial experience including reviewing scientific manuscripts and editing a wide range of materials including book proposals, research grants, short stories, children’s books, and scientific journal articles. Barbara Zito is the story-teller or raconteur who has woven the storylines with scientific principles to create each of the stories of The Sign Tracker Trilogy. She has drawn from her extensive readings on Native American history, biography, and legends, to create a novel genre, the scientific short story. Her enchanting stories are designed to entertain the reader, while, at the same time, bringing to the attention of the general public the role of sign-tracking in the drug addiction process. Arthur Tomie, Ph.D.: Arthur Tomie is a professor and addiction research scientist. He currently holds two faculty appointments at Rutgers – The State University of New Jersey: Associate Professor, Department of Psychology, Graduate Program in Behavioral and Systems Neuroscience, 152 Freylinghuysen Road, Rutgers – The State University of New Jersey, Piscataway, NJ 08854-8020, and Adjunct Associate Professor, NeuroPharmacoGenetics Lab, Center of Alcohol Studies, 607 Allison Road Piscataway Township, NJ, 08854-8001. Professor Tomie has published over 70 scientific manuscripts and his research on sign-tracking has been funded by the National Science Foundation and the National Institutes of Health. He has written a number of full-length theoretical reviews which appear in a wide range of top-drawer scientific journals, including Clinical Psychology Reviews, Neuroscience and Biobehavioral Reviews, Brain Research Reviews, and Current Drug Abuse Reviews. Professor Tomie is widely recognized for pioneering the application of sign-tracking into the realm of drug addiction. Professor Tomie is a decorated combat veteran who rose to the rank of Sergeant (E-5) while serving with the lst Brigade, 5th Infantry Division, United States Army, in Quang Tri Province, Republic of Vietnam, in 1969-1970.
tailoftheraccoon.com website: The tailoftheraccoon.com is an educational website developed by Arthur Tomie and Barbara Zito to inform the general public about Sign-Tracking and how Sign-Tracking contributes to the development of excessive and compulsive drug-taking. 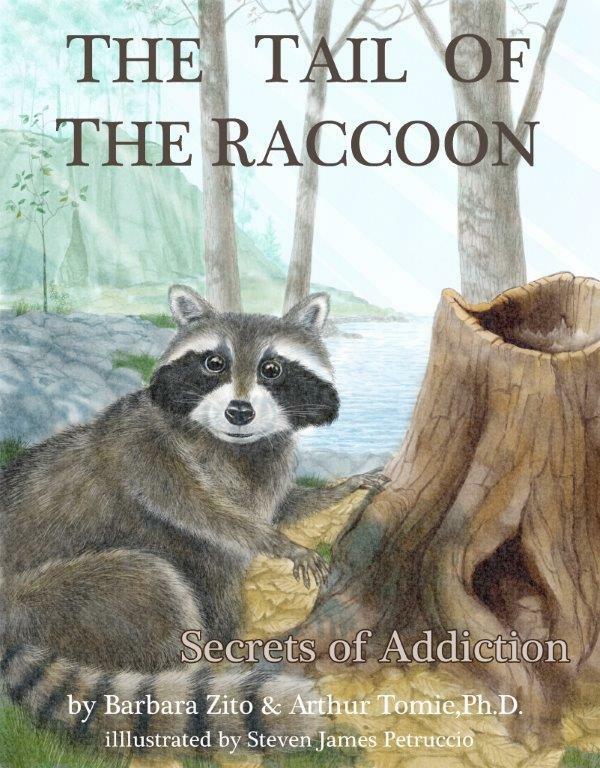 All materials on the www.tailoftheraccoon.com website are protected by Copyright © 2014 Barbara Zito and Arthur Tomie. The tailoftheraccoon.com website is operated by ZT Enterprises, LLC, under the terms of a Licensing Agreement, 2014. Readers are encouraged to contribute testimonials relating their personal experiences with drug addiction, particularly as it may relate to sign-tracking. Testimonials should be sent to the e-mail address of the website: tailoftheraccoon.edu@gmail.com. All e-mail correspondence sent to the website are confidential. Personal testimonials are published on the website, in whole or in part, only with the written permission of the contributor, who shall remain anonymous. This website was created and is maintained by Kelli Curiotto. For questions or concerns regarding the website maintenance please contact kelli.curiotto@gmail.com. All rights reserved. No part of this website may be reproduced, stored in a retrieval system, or transmitted in any form or by any means, electronic, mechanical, photocopying, recording, scanning, or otherwise, beyond that permitted by U.S. Copyright Law, Section 107, “fair use” in teaching or research, Section 108, certain library copying, or in published media by reviewers in limited excerpts), without prior written permission from the publisher (ZT Enterprises, LLC). ZT Enterprises, LLC: ZT Enterprises, LLC is the publisher of the stories of The Sign Tracker Trilogy. Under the terms of a Licensing Agreement with the Authors, Arthur Tomie and Barbara Zito, ZT Enterprises operates the tailoftheraccoon.com website, which is devoted to the dissemination of information about prevention of drug abuse, Sign-Tracking, and the relationship between Sign-Tracking and drug addiction. The company website, ztenterprisesllc.com, is currently under development. Correspondence should be sent to ztenterprisesllc@gmail.com .